Asian cabbage salad is my sweetheart for a long time which I keep repeat making it often. As this is simple, healthy, and amazingly delicious. Loaded with fresh vegetables, and crunchy nuts. This is vegetarian, clean eating, real food recipe. Best for mid-day snacking or a perfect side dish. All the ingredients are fresh vegetables, fruits, and nuts, except one. What is that? Keep reading the answer is in the recipe. Are you skeptical about cabbage in a salad and how will this turn out in the dinner table? I know many of you have a love-hate relationship with cabbage. To your surprise, this Asian cabbage salad recipe will not disappoint you. As its co-ingredients would flawlessly balance and compensates bold flavor of the cabbage. If you are a veggie lover, I’m sure that you will love this recipe. And if you’re not a veggie lover, still you will like this dish a lot because of its simplicity and delectableness. Asian cabbage salad is one of the side dishes our family loves to have most of the time. It is easier for me as well, as I do not need to strain myself in gathering the ingredients. Where I can make it with the pantry ready items. It takes just about 15 minutes even if we make from scratch. There is more room for customizing and more variations. How does this Asian cabbage salad taste like? This asian cabbage salad with ramen noodles tastes simple, fresh and light. And gives you a feeling like not chewing raw vegetables. It is citrusy, sweet, and crunchy. This has multiple folds of taste in each bite. 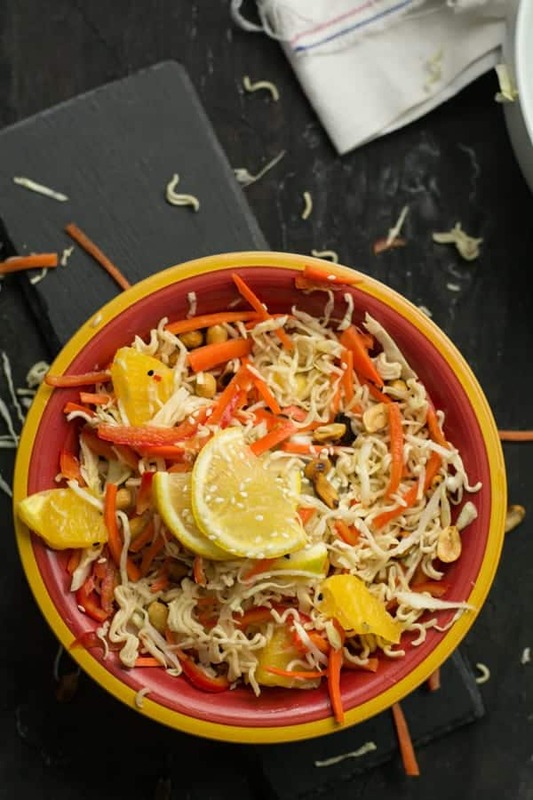 You feel the lemon and then the crunchy veggies, nuts, and soft oranges. Each ingredient hits you with the splendid bundle. Who said that Chinese recipes always made with the sauces? This salad can change your obsession. This salad does not require soy sauce or chili sauce but made with all fresh ingredients. Moreover, I have made little tweaks and healthy swaps to the salad I had from a Chinese restaurant. This is the main ingredient and you may use either the green cabbage or purple cabbage or the combination of both. The blend looks colorful and contrast and I would highly recommend using these two if you’re planning for a party. However, you can make with green cabbage alone as I did today. Really, anything with work. The next most important ingredient in the recipe. If it is a salad, we talk about the color to make it look appeal. And carrot does the main role in giving pleasing look, additionally, it is nutritious as well. Furthermore, it also contributes to the crunchy texture and perfectly balances the flavor of the cabbage. Cabbage and carrots are inseparable and of course the same in Asian cabbage salad applicable here as well. Here, I have mentioned is ready to cook Top Ramen noodles. Looks striking plus adds crunchy texture and makes this salad loved even by kids. This is the Asian style substitutions for the crotons in this Asian cabbage salad. I enjoy adding these on the fresh salad, it is crispy and chewy. This is one of my latest kitchen discoveries and I’m relishing it so far. You may add green pepper or yellow pepper instead. It is the color buster in the salad making it appetite. Likewise adds a flavor and mild sweetness. Alternatively, you may skip using, you don’t have it handy. 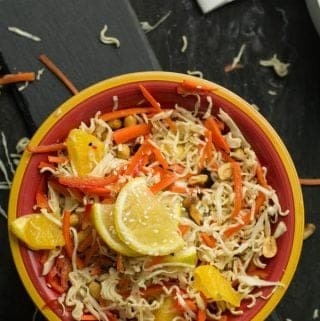 You will not believe how amazing the Asian cabbage salad would be when combining with oranges. The combo is cool with the crunchy cabbage with the juicy oranges. Munching the slices of oranges in between the crunchy chewy vegetables is an immense pleasure, and this made us fall in love with this cute addition. I have a chosen this for garnishing which also gives authentic Chinese look. But adding is optional, as this will not impact much. For better taste, pan roast them until it changes its color slightly and aromatic. This adds a good amount of protein to the salad. I know the people have openings between the roasted peanuts in the salad. But this adds a different dimension, in addition, makes the Asian cabbage salad recipe as one of its kind. However, if you do not prefer, you can swap with sunflower seeds or almond slices. To make this salad as skinny as possible, I have opted for lime dressing. Which is also would be perfect for any salad in the world. Freshly squeezed lemon would good. This one ingredient has a potential to convert any regular dish to taste like Chinese. Getting them here in the United States is not that hard you think, I got mine from my local Walmart. But in its absence, you replace with apple cider vinegar and the taste of Asian cabbage salad will differ accordingly. This makes complements the salad and makes the dressing denser to coat the ingredients evenly. And what’s more? it is healthy and nutrient rich as well. 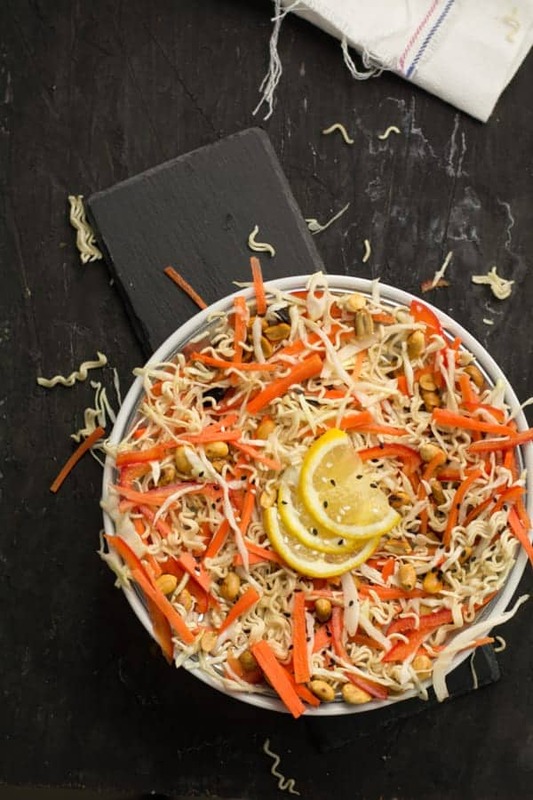 How to make Asian cabbage salad recipe? Chop the vegetables– Chopping them to the size of the match stick will make half of the work done. Cutting cabbage, carrot, red pepper this way makes it authentic. Asian cabbage salad dressing– In a small mixing bowl, add lemon juice, honey, rice vinegar, and honey. Stir until dissolves completely. To cut out the extra calories I have not added any fat. But if you prefer you may add any salad oil here. 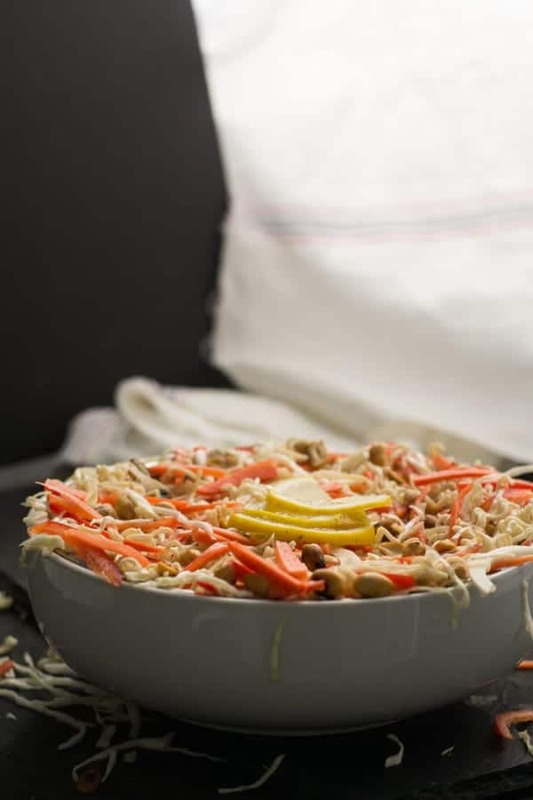 Toss– In a large mixing bowl, add julienne cut vegetables, roasted peanuts, crumbled Top Ramen and the salad dressing. Give them a gentle mix until the whole thing combined. Then garnish with roasted sesame seeds. Serve– Serve immediately in the small bowls along with your main course. This salad is versatile, can be served as an appetizer, or as a lean whole meal. It is better to eat Asian cabbage salad right away or at least within 3-4 hours. As Top Ramen and the roasted peanuts will become soggy and may taste not be good after a while. This is the basic recipe and made with the very simple ingredients. And the sky is the limit for customizing. Please do feel free to add in your favorites. Add in extra veggies- You can also add the vegetable like cucumber, green pepper, cauliflower, broccoli. Every added ingredient brings a whole new appearance. Add in Cheese- If you are feeling that you are missing cheese. You are most welcome to add grated cheese. Which makes this an exotic fusion recipe. How to store Asian cabbage salad? As I have discussed before, this is better to consume it immediately. If you planning to make ahead, then you may store the chopped vegetables, the dry ingredients and the dressing separately. Combine them whenever needed. What and how to serve? Most often I serve Asian cabbage salad with steamed rice. This is additionally best to serve with white rice, brown rice, quinoa, bulgur or barley. Serving them with warm tortillas or with any other traditional Tapas would also work out. Since this turn better with any of your main course you name it. Cut cabbage, carrot, and green peppers to julienne. Keep aside. In a small mixing bowl add lemon juice, rice vinegar, salt, and honey. Give a quick stir until honey dissolves. And keep aside. In a large mixing bowl, add the vegetables. Break Top Ramen to small chunks and add. Add roasted peanuts, roasted sesame seeds. Combine them until the vegetables coated well with the dressing. Serving with grains like brown rice, white rice, quinoa would be the best option.